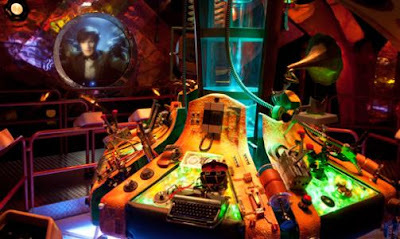 The attraction, which closed in London in February to make its move to Cardiff Bay will features sets, props and memorabilia from the show. The interactive journey takes you along in the TARDIS with the Doctor on a adventure though time and space. You help the Doctor escape from Daleks, Cybermen and Sontarans and fly the TARDIS. The ride includes exclusive filming with Matt Smith and is a great experience for the kids or the kid in all of us. The new 3,000 sq m building is at Porth Teigr, next door to the BBC's Roath Lock studios, where Doctor Who, Casualty and Pobol y Cwm are produced and is expected to attract up to 250,000 visitors a year. "I'm thrilled to be formally accepting the keys to the building on Monday and can't wait to start moving in." said Paula Al-Lach, head of exhibitions and events at new tenants BBC Worldwide. "We've worked hard to create an outstanding visitor attraction with the Doctor Who Experience.. It's the first ever interactive Doctor Who exhibition and for our Cardiff opening we have some exciting new exhibits to be displayed in public for the very first time." "Doctor Who is a global brand and is something that has really helped boost the profile of Cardiff internationally." said Ken Poole, Cardiff council's head of economic development. "This attraction will bring millions of pounds into the economy and the benefits to Cardiff will be immense in terms of tourism."